The first half-century’s history of the Association was recorded in a booklet Scottish Pelagic Fishermen’s Association: The First Fifty Years written by Bob Tait and published in 1982. The booklet which chronicled; the reasons behind the formation of the Scottish Herring Producers’ Association, difficult early years, the war and its aftermath, the age of transition and the decade of the EEC, is presently out of print. 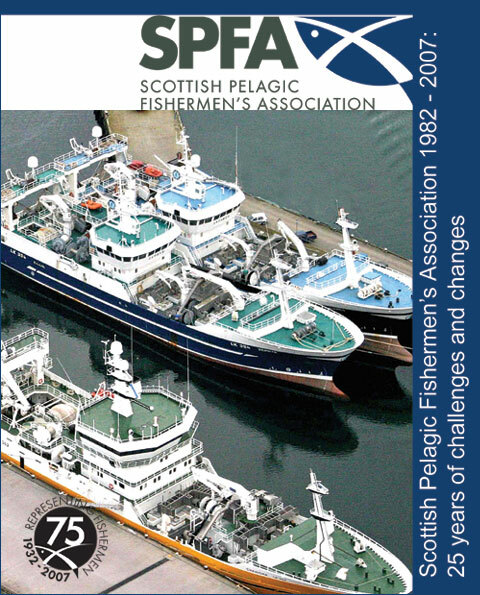 In 2007 to celebrate the Association’s 75th Anniversary, the board commissioned the publication of a booklet recording the work of the Association, the development of the pelagic fleet over the years and the condition of the pelagic stocks during the period 1982 – 2007. The booklet contains three chapters. The sections on the work of the Association and the Scottish pelagic fleet are written by Derek Duthie and David Linkie respectively while the pelagic fish stocks are covered by John Simmonds and Emma Hatfield scientists at Fisheries Research Services, Aberdeen. Copies of the booklet are available for £8.50 including postage and packaging by contacting the Association.